A more accurate title for this post would be “How to Earn Points and Miles when the Merchant Does Not Accept Credit Cards,” however that is simply too long a title. One example of this would be college tuition. Most colleges charge a 2.5-3.5% fee when using a credit card to pay for tuition, which would make using a credit card not worth the points. Another example would be a mortgage or student loan. You cannot pay either of those with a credit card, because it would be like paying a loan with a loan. Even if you cannot pay directly with a credit card, all is not lost, you can still earn points! There are a few options if the merchant will only accept debit cards and not credit cards. Your first option is to simply use the Bluebird method, which is where you buy Vanilla Reloads with a credit card then load your Bluebird with the Vanilla. Some places that only accept debit cards, do not accept American Express, so Bluebird is not always an option. If that is the case, you can use the gift card method since MasterCard and Visa gift cards are now basically debit cards. The gift card method is where you buy a prepaid gift card with a credit card, set a PIN on the gift card, then use the gift card as you would a debit card. Every Visa and MasterCard gift card is able to have a PIN set on the card as of April, 2013. That also means that setting a PIN on every card is different. You will need to read the pamphlet that comes with the card to know how to set one on your card. It will likely require you to call a number, go to a website, or simply set your own PIN during the first purchase on the card. Another more permanent option would be to get a prepaid card that is either a Visa or Mastercard. Currently, I am testing out the prepaid Visa Buxx card, which I will post about at a later date. The Visa Buxx card is not your only option though, there are literally hundreds of different prepaid cards that you could use. A few are the PayPal prepaid card, My Vanilla Debit, GoBank, and Netspend. They are basically a debit card that is not hooked up to a checking account. This option works great when you have a prepaid card that can be loaded directly, or indirectly with a credit card. 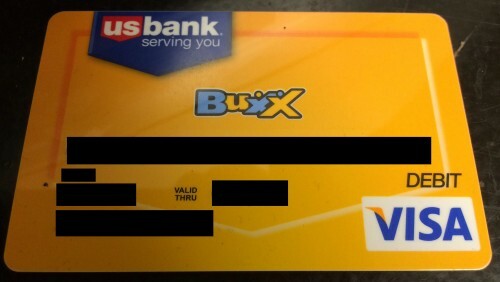 The Visa Buxx card can be loaded directly with a credit card for a fee and the Paypal prepaid card can be loaded indirectly via Vanilla Reloads. I have not used either of these cards, do to the monthly/annual fees they offer, however if the other methods do not work, this would work as a last resort. Mortgages, student loans, and car loans do not accept debit cards or credit cards, so you are stuck paying with a bank account. Fortunately, there are ways to still earn points and miles this way! My personal favorite way to do this is with Bill Pay. I prefer using Bluebird’s Bill Pay, however Evolve Money and Walmart work great as well. To make points or miles from Bluebird’s Bill Pay, you simply need to load your Bluebird account with VRCs that you bought with a credit card. If this is not an option, you can use Evolve Money instead. Evolve Money only allows you to use a debit card to pay bills, so you will need to use one of the tips listed above to send a bill with Evolve Money. If you want to learn more about Evolve Money you can read this Flyertalk thread. If you have a Walmart close to your home, they have a great Bill Pay system that you can use as well. All you need to do is take a PIN based debit card to your local Walmart Money Center and ask to pay a bill. This will cost $1.88-$3.95 per bill, while the other options are free, but this just gives you one more way to pay a bill that only allows the use of a bank account. This one is a bit tricky, but it works very similarly to some other manufactured spending techniques. All you need to do is load up a prepaid card directly or indirectly with a credit card, go to an ATM and withdraw cash. Some cards charge a fee for this, so try to do this with a card that doesn’t charge a fee. You can withdraw from an ATM for free with a Bluebird card if you have direct deposit hooked up to your account. Visa Buxx also gives free US Bank ATM withdrawals. Another method would be to buy a money order with a gift card and cash that money order out. In this era of manufactured spending, there is virtually no reason not to earn points/miles on every purchase. Have Questions? Leave them in the comments.